Efficient invoice capture helps you take control of payments – and save money in the process. Invoices arrive on paper, through emails, or payment systems. Quickly record verified requests using one accurate and automated solution: Concur Invoice Capture, a feature of Concur Invoice. Optical character recognition (OCR) technology scans printed or faxed invoices to automatically populate a payment request. Your staff only needs to verify the results and add to your company's workflow. If you don’t want to dedicate staff to invoice entry, you can have Concur Invoice Capture handle the work. It can record your company's invoices and add the verified requests to your normal workflow. For the most friction-less invoice capture, Concur Invoice can receive electronic invoices directly from suppliers. 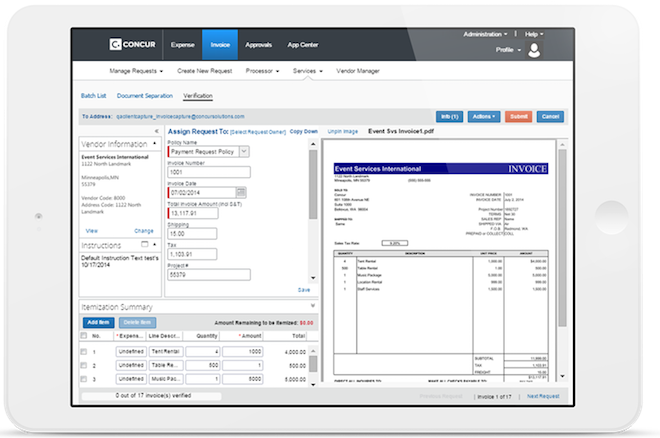 If suppliers are using Tungsten Network (formerly OB10), Concur Invoice Capture automatically maps, formats and populates their electronic invoice data into Concur Invoice.